Good sermons have the power to transform lives, and few preachers are more legendary for their sermons-or more quoted-thank Frederick Buechner. It is through Fred Buechner's sermons that we experience his genius most closely. Clergy hungry for sermon inspiration and fans of his great literary works will be well served by this collection, organized chronologically to reveal the development of Fred Buechner's theology and ideas. 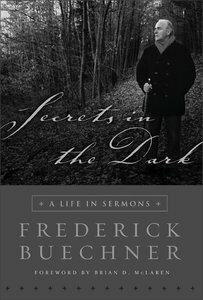 About "Secrets in the Dark"
Frederick Buechner, author of more than thirty works of fiction and nonfiction, is an ordained Presbyterian minister. He has been a finalist for both the Pulitzer Prize and the National Book Award and was honored by the American Academy of Arts and Letters. His most recent work is "Beyond Words: Daily Readings in the ABC's of Faith".